"This is a tasty and cool salad that is perfect for a summer supper. If you don't like broccoli and carrots, substitute your favorite fresh vegetables!" In a bowl, whisk together the orange juice, vinegar, olive oil, seasoning blend, and sugar. Set aside about 1/2 cup for basting. Lightly oil the grill grate. Grill chicken for 6 to 8 minutes on each side, basting frequently with the reserved portion of the dressing, or until juices run clear. Cool, and cut into strips. Discard basting sauce. In a large bowl, toss together the lettuce, oranges, broccoli, and carrots. 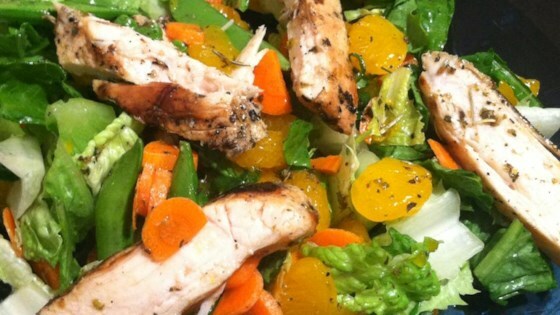 Top the salad with grilled chicken strips, and drizzle with remaining dressing to serve. I used this dressing as a marinade and marinated the chicken breasts for 3 hours then grilled them. They were phenomenal. My husband couldn't stop saying mmmm! good but kind of a lot of hassle for what it is. Tasty refreshing salad,Jill! Everyone loved the dressing, especially. I added spinach and baby mixed greens to the romaine. Yum. Thanks for sharing. Very flavorful and easy vinegarette dressing. I added green onions to the salad for extra taste. This recipe will be used often in our household. Nice, light, refreshing and tasty. A very wonderful healthy dish that keeps the calories down without sacrificing taste. My husband is a very picky eater, 'oranges and chicken', you know that look, but he liked it, he liked it. Maybe I should change his name to Mikey.